John receives his Revelation. 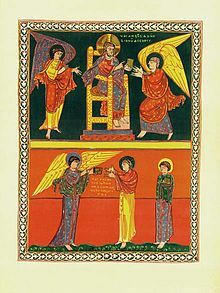 Saint-Sever Beatus, 11th century. 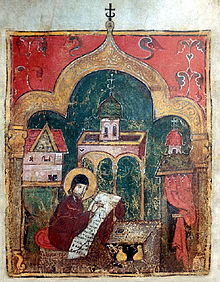 1George the Monk, also called George the Sinner, Greek Georgios Hamartolos (flourished 9th century), Byzantine historian, author of a world chronicle that constitutes a prime documentary source for mid-9th-century Byzantine history, particularly the iconoclast (Greek: “image destroyer”) movement. 2Philip of Side or Philip Sidetes (ca 380 - after 431), a historian of the early Christian church, was born at Side, the ancient Greek Iconium, Pamphylia (the modern Konya, Turkey). He wrote a Christian history of which fragments survive. Philip may be the last writer to quote Papias, and is best known for his statement that in the second book of the latter's five book treatise, Papias reported that the Apostle John was "killed by the Jews". He studied in Alexandria under Rhodon, and was teaching in Side about 405. Later he was a priest in Constantinople in the close circle of John Chrysostom, and he was a candidate for the patriarchate of Constantinople against Sisinnius (425), Nestorius (428), and Maximianus (431). Of his numerous books only fragments remain, his history of the Christian church, his polemic against the Emperor Julian. 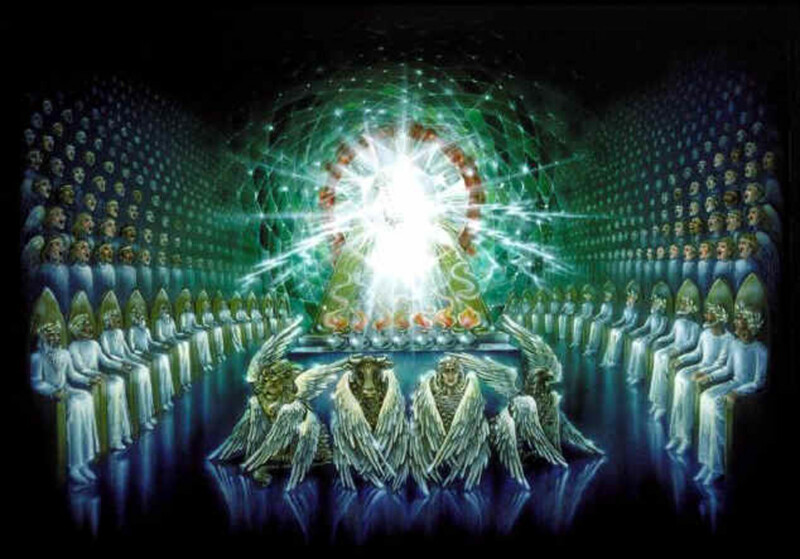 3 Revelation 6:9 When He opened the fifth seal, I saw under the altar the souls of those who had been slain for the word of God and for the testimony which they held. 4 Revelation 11:1-2 Then I was given a reed like a measuring rod. And the angel stood,[a] saying, “Rise and measure the temple of God, the altar, and those who worship there. 2 But leave out the court which is outside the temple, and do not measure it, for it has been given to the Gentiles. And they will tread the holy city underfoot for forty-two months. 5 1 Peter 5:13 She who is in Babylon, elect together with you, greets you; and so does Mark my son. 14 Greet one another with a kiss of love. 6Gaius Cestius Gallus (d. 67 AD) was the son of a consul in ancient Rome. He was legate of Syria from 63 or 65. He marched into Judea in 66 in an attempt to restore calm at the outset of the Great Jewish Revolt. But was unable to take The Temple Mount. During his withdrawal to the coast his army was ambushed near Beth Horon, and only succeeded in making good his escape to Antioch by sacrificing the greater part of his army and a large amount of war material. Soon after his return Gallus died (before the spring of 67), and was succeeded in the governorship by Licinius Mucianus. Emperor Nero appointed General Vespasian, the future Emperor, instead to crush the rebellion. 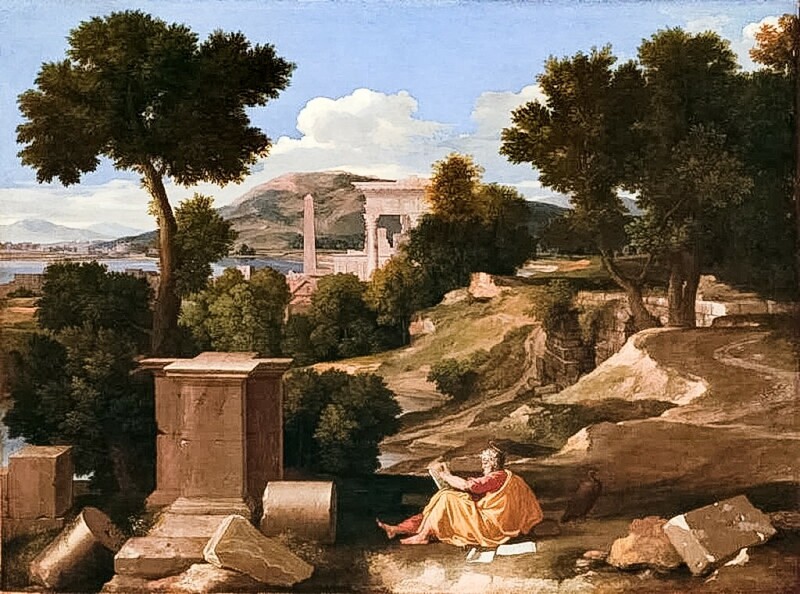 7 Dr. John Gill wrote in his work entitled, An Exposition of the New Testament, in 1809, "...it is remarked by several interpreters, and which Josephus takes notice of with surprise, that Cestius Gallus having advanced with his army to Jerusalem, and besieged it, on a sudden without any cause, raised the siege, and withdrew his army, when the city might have been easily taken; by which means a signal was made, and an opportunity given to the Christians, to make their escape: which they accordingly did, and went over the Jordan, as Eusebius [an early church father] says, to a place called Pella; so that when Titus [another Roman general] came a few months after, there was not a Christian in the city..." More on this later! 8 Revelation 2:8-10 “And to the angel of the church in Smyrna write, ‘These things says the First and the Last, who was dead, and came to life: 9 “I know your works, tribulation, and poverty (but you are rich); and I know the blasphemy of those who say they are Jews and are not, but are a synagogue of Satan. 10 Do not fear any of those things which you are about to suffer. Indeed, the devil is about to throw some of you into prison, that you may be tested, and you will have tribulation ten days. Be faithful until death, and I will give you the crown of life. Upon the completion of the last Kingdom article, which concerns itself with the window of opportunity for the fulfillment of the prophecy found in Matthew 24:3-34, it seems right to me to take a look at the date for the writing of the book of Revelation. For, whether Revelation was written before, or after, the destruction of the Temple in Jerusalem, and the desolation of the Jewish nation, determines how its prophecies are to be understood. For example: if the book of Revelation was written AFTER the taking of Jerusalem and the razing of the temple then one must look beyond the first century for the fulfillment of ALL its prophecies. On the other hand, if Revelation has an earlier date than A.D. 70 then much of its content is very likely to have been fulfilled within the context of Jerusalem’s destruction by the Romans. 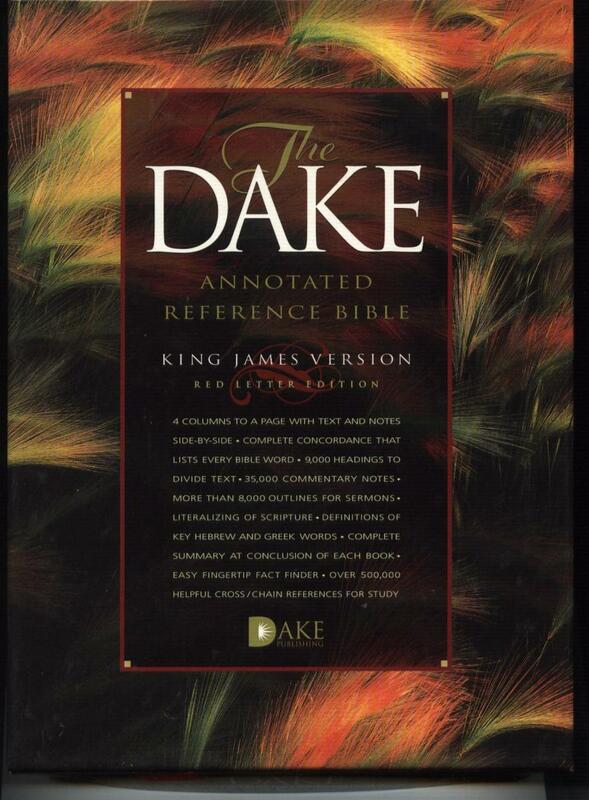 This writing will examine the issue and attempt to answer the question: Does Revelation have an early date (i.e. before A.D. 70), or a late date (i.e. after A.D. 70). Two periods have been suggested for the date of the writing of the Revelation. We can best categorize these periods as an EARLY, or LATE dates. The “early” date would most likely be within the reign of Nero Caesar (A.D. 54-68), while the “late” date would be the reign of Domitian (A.D. 81-96). While there is much EXTERNAL evidence (namely, evidence outside of the Bible itself) that would suggest a later date (the traditional date is A.D. 95). This “EXTERNAL” evidence is supplied primarily by the Catholic fathers: Irenaeus, Clement of Alexandria, Origen, Victorinus, and Eusebius. None of which are representatives of the Apostolic Faith of the first century. Juxtapose to these witnesses is the INTERNAL evidence (i.e. biblical) which indicates the earlier date of Nero’s reign (A.D. 54-69). Before we look at the INTERNAL evidence for the early date, it will be good to explore the witnesses for the late date theory. Primarily, we will look to Irenaeus and Eusebius. Irenaeus is third century; Eusebius is fourth century. While both Irenaeus and Eusebius argue for the late date of the reign of Emperor Domitian (for the writing of the book of Revelation) they are not agree on the author. Irenaeus says John the apostle; Eusebius says, John the elder. Furthermore, it appears that the late date and the Ephesus residents of John the apostle go hand-in-hand. Irenaeus claims that through his teachers, Polycarp and Papias, he has direct record of John the apostle’s residence and work in the Ephesian region (Her. III.3.4; V.33.4). Irenaeus reports hearing these things from Polycarp when he (Irenaeus) was a boy (Eusebius, History, V. 20. 5). Irenaeus, further claims that Papias was a hearer of John the apostle. Counter to this. Eusebius states flatly that “Papias himself, in the preface to his discourse, makes it plain that he was in no sense a hearer and eyewitness of the holy apostles” (History’s, III. 39. 2). Eusebius goes on to quote Papias as making a distinction between the apostle John and John the Elder (Histories, 39. 2). Polycrates of Ephesus speaks of the Ephesian residents of “John” and adds that he was a “priest, wearing the sacerdotal plate” (Eusebius, Histories, V. 24. 3); this would suggest a “John” who was of priestly origin—most likely not the apostle. At any rate, if Irenaeus was wrong concerning Papias having heard John the apostle, and he seems to have been, then the force of his testimony is considerably weakened. Compounding his credibility problem is his apparent confusion over James, the Lord’s half brother, with James the son of Zebedee (Iren. Her. III. 12. 15.). Another concern to me is the fact that both Polycarp and Ignatius writes epistles to the church at Ephesus and neither mention John at all—let alone as having a long term residents there. The absence of the Apostle John from the epistles of Polycarp and Ignatius to the church at Ephesus seems odd, and unlikely if - as tradition has it - Ephesus was the headquarters of John’s bishopric. Ignatius, in his letter to the Ephesians, speaks of Paul, but not of John. What is clear to me is that in the zeal of the ancient advocates to establish a late date (which requires a long life for John—thus, the Ephesus residency and bishopric) for the book of Revelation that they claim too much. And one might ask, Why? I will attempt to give a very short answer and you may take it for what it is worth. Irenaeus is the first of the Catholic Fathers. This, particular, strain of the Church felt a strong need for an apostolic touchstone. Irenaeus tried to bridge his church, via Papias and Polycarp, to the apostolic Church of Apostle John. The claim of Irenaeus of Lyon is unconvincing as reliable evidence. The holy Scripture presents several examples of internal evidence for an early date for the writing of the book of Revelation. At the opening of the fifth seal (6:93), John was shown the souls of martyrs that were under the altar. The altar in view here is the altar of Holocaust which was an important part of the Temple in Jerusalem. This is not a vision of a heavenly altar, because it is the breaking of one of the seven seals which all relate to the earth. This passage, then, presupposes the existence of the earthly temple, with its altar, at the time of the writing of Revelation (i.e. pre-A.D. 70). Second, and similarly, there is the instruction given to John to measure the Temple (11:1-24). Again, the passage presupposes the existence of the Temple at that particular time. Added to this is the fact that the book of Revelation nowhere mentions the destruction of the Jerusalem Temple. The Temple was destroyed in A.D. 70; therefore, the internal evidence indicates an early date for the writing of Revelation. Notice that the above passage states: “... and the woman fled into the wilderness where she had a place prepared of God ...” This prophecy was fulfilled when the Romans lifted their siege from Jerusalem (Josephus states that the Roman general Cestius6“... retired from the city, without any reason in the world.” Wars of the Jews 2. 19. 7) and withdrew their army to Caesarea; during which time, the Christians fled the city. The Christians crossed the Jordan River, and entered the wilderness of a Pella.7 (Pella was not under Roman control until A.D. 117.) Since the prophecy was given before its fulfillment, and since it was realized in the late 60s, it follows that the Revelation was written earlier. Moreover, the prophecy of “tribulation ten days,” given to the Church at Smyrna (2:8-108), speaks of the ten years of persecution during the reign of Domitian (A.D. 81-96). If Revelation is, indeed, viewed as prophecy, it must be accepted that it had a writing earlier than Domitian’s persecution; which argues for the earlier date theory. Lastly, some would argue that the level of persecution at this early date (mid-50s to mid 60s) was not such that would produce the circumstances which landed John on the island of Patmos. That argument, however, is unconvincing when Peter writes in the early to mid-60s of severe persecution upon his church. “Be sober, the vigilant; because your adversary the devil, as a roaring lion, walkus about, seeking whom he may devour: 9 whom resist steadfast in the faith, knowing that the same afflictions areaccomplished in your brethren that are in the world. In my humble opinion, I have presented biblical evidence as to why I have accepted an early date. Moreover, I presented factual, researchable, evidence as to why I reject the testimony of Irenaeus and Eusebius. 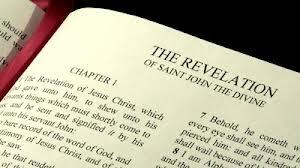 Dear reader, the conclusion of the matter is that when teaching the book of Revelation you must allow for its early date of writing, and that much of its contents were fulfilled within the first century A.D. 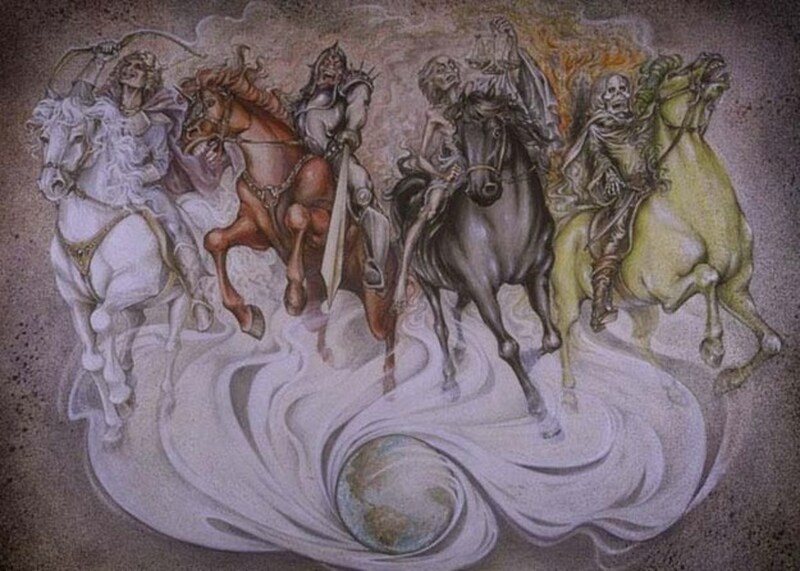 The biblical book of Revelation is apocalyptic literature and as such is cryptic in nature. There are messages encrypted within the text. The list of the twelve tribes delivers just such a message. The article before us examines the "signs" Jesus gave in Mt 24. Signs, which Jesus said would appear before the end of the world/age.